Clover Park is a 2 acre neighborhood park located in the City of Dublin as part of the SubArea 3 Neighborhood Square Capital Improvement Project. 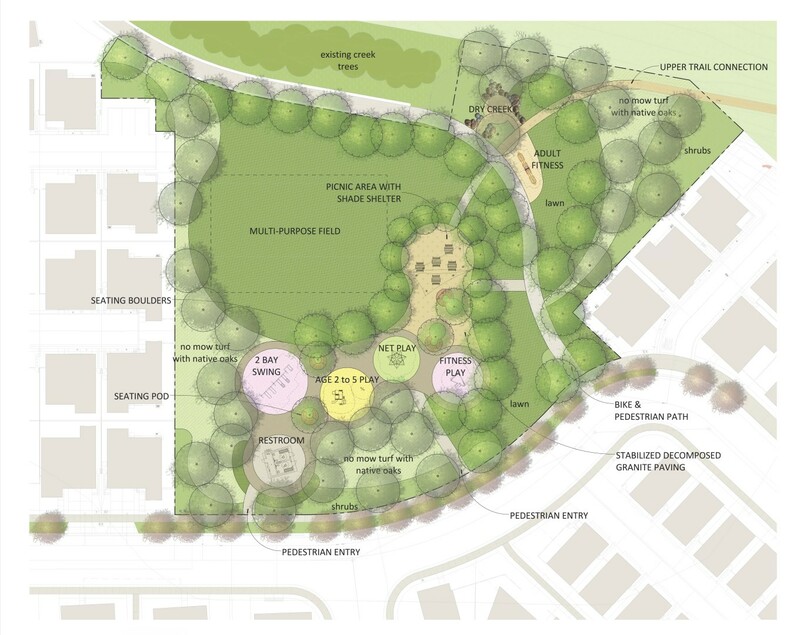 The design for the park includes an informal lawn for passive activities; a picnic area with shade shelter; children’s fitness and play equipment; fitness equipment for adults; enhanced creek overlook; and restroom facilities. The park serves as an important link between adjacent neighborhoods, parks, and recreational activities. Clover Park is part of the City of Dubin Parks and Recreation Masterplan comprising of 73 acres of new parks and recreation facilities and 290 acres of existing parkland. Some valuable features of the site include its shared northern boundary with open space and trail connection, a Class I Bike Trail that crosses through the square from north to south and proximity to a creek corridor.